Situated just 10 km from the Nisqually Entrance of Mt. 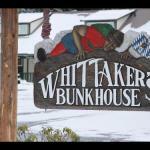 Rainier National Park Whittaker's Motel & Historic Bunkhouse is located in Ashford Washington. An outdoor hot tub and a cafÃ© with 8 flavours of ice cream are featured on site. Each uniquely decorated guest room here features a fan a radio and an en suite bathroom with a bath shower and free toiletries. Select rooms boast a microwave and a refrigerator. Ski equipment rentals a gift shop and daily maid services are some of the amenities available at Whittaker's Motel & Historic Bunkhouse. Several outdoor activities can be enjoyed in the area such as hiking fishing and horse riding. A general store as well as a local restaurant and lounge are within 5 minutesâ?? walk of the motel. Seattle-Tacoma International Airport is 107 km away.